Alicia and I attended a lecture tonight by Wally Owen at the Lyceum, Alexandria's History Museum, called, "A Visual Tour of Civil War Alexandria." Wally Owen is the Assistant Director of the Fort Ward Museum and co-author of "Mr. Lincoln's Forts: A Guide to the Civil War Defenses of Washington." The lecture was a two hour tour of Alexandria in the Civil War including a finale where everyone got to see some of the stereoscopic images in 3D using funky two color glasses. It was a wonderful presentation. Wally literally had the audience gasping in amazment as he showed some of the details in the high resolution photos available from the LoC and other places. He also showed examples of how he does detective work to identify photos, locations, dates and other details through cross correlation of photos and original documents. The advance billing for the talk said some of the photos had never been published and indeed, there were several that I have never seen before. Some highlights that I noted included. 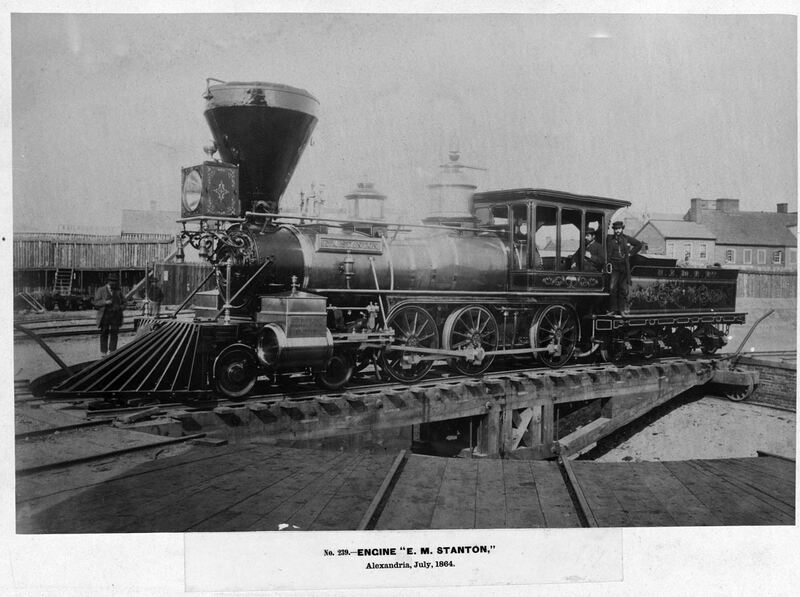 A photo of an engine parked in front of the Wilkes Street tunnel showed a large light mounted on the tender. 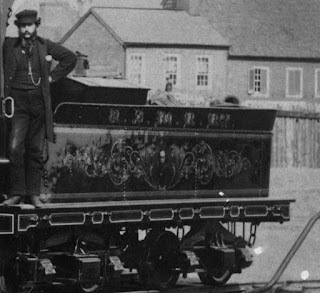 I don't think I have ever seen a shot showing a back-up light on the tender. That was cool. He presented a shot of the Alexandria, Loudon and Hampshire engine terminal that showed the view from the east to the west. It had a lot of good detail of the AL&H terminal. Anyone modeling the AL&H needs to get a copy of this photo. Wally did not mention the source of that photo. Wally mentioned that W. M. Merrick, the draftsman that drew several important maps of Alexandria, Washington and City Point, was friends with Captain Andrew Russell, the photographer. Wally showed a sketch that Merrick drew of Russell painting the tender of the engine Stanton. This engine has an elaborate painting of secretary Stanton on the tender. Apparently Russell's first avocation was as an artist and he learned photography on the fly in 3 months during the war while in the employ of Haupt. Wally speculated on what else Russell may have painted, perhaps the eagle on the Lincoln funeral train. The presentation was chock full of interesting information. It was well worth attending. The cold, icy weekend meant lots of progress on the layout. First I reconfigured the slope of the hill behind Potomac Creek to make it look more like a country road. This resulted in a slightly sunken road at the top of the ridge. Then I painted the rocks at Wiellep's Cut with a dark base color. I find that when using water putty for rock carvings, one can not just stain the rocks like you can with hydrocal. You have to completely paint the rocks. I use a dark base acrylic color and then add lighter drybrushed colors on top. Next I worked on the culvert at Accokeek Creek. It is built like a railroad tunnel, but without the tracks. I used the laser to cut the parts except for the styrene blocks on the top cap. Those I made from a strip of .125 inch styrene, shaping each block to look like stone. plastic strip stone cap pieces. The brick lined culvert pipe. Cutting and fitting the culvert under the tracks. I also worked on installing the grist mill, but it was tricky as I had to add the mill race to the mill as I went along. That took a bit of cutting, filling and test fitting. I had to reconfigure the terrain under the mill race to make room. I sealed the terrain with water putty. I need to make the area water tight as I plan to pour resin to simulate the water and it needs a water tight base. Working on the tail race. I still need to build the feed race sluice. design. The wooded hill will help downplay the visual dominance of the dam. 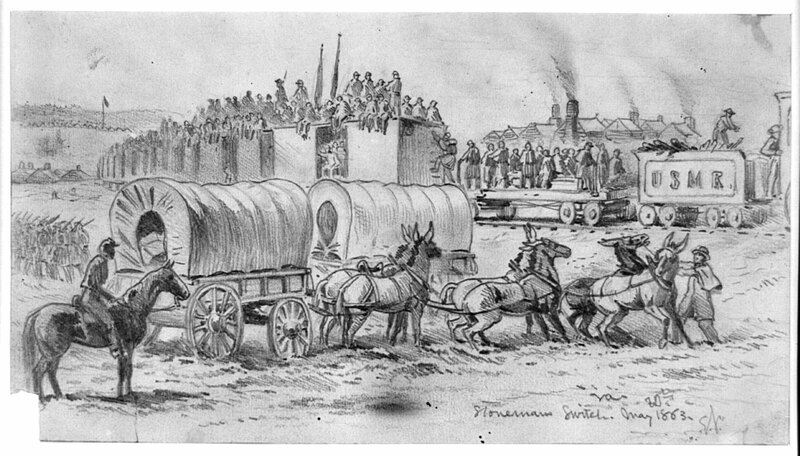 The Potomac Creek station scene will feature a long line of soldiers marching on a road to the railhead. The road leads from the back drop to the railhead at Potomac Creek. My intent is to display a regiment with each figure shown one-to-one. A full strength regiment has over 1,000 men. 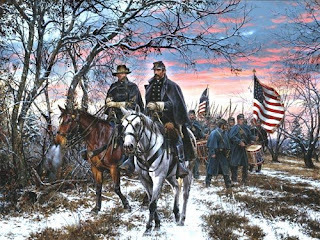 At two years into the war, most regiments were at partial strength. I have about 400 figures planned in this scene, representing a regiment that is about one third full strength. The figures I am using look quite energetic and excited, so I decided this is a two year regiment whose enlistments have expired and they are going home. There will be other soldiers and people watching them and cheering along. This drawing showing two-year men taking a train is part of my inspiration. I built the road with pieces of foam hot glued to the hard shell. In retrospect, I think the road is too well built for a country dirt road of the 1860s. So I will add a ridge as shown in the photo below and have part of the road cut through ridge top, creating a sunken section. That will remove some of the fill and make the road look more rustic. The red lines show the planned terrain addition. word "pink" shows through, as that is the last pink scenery in the north room. I added some ballast and base scenery. 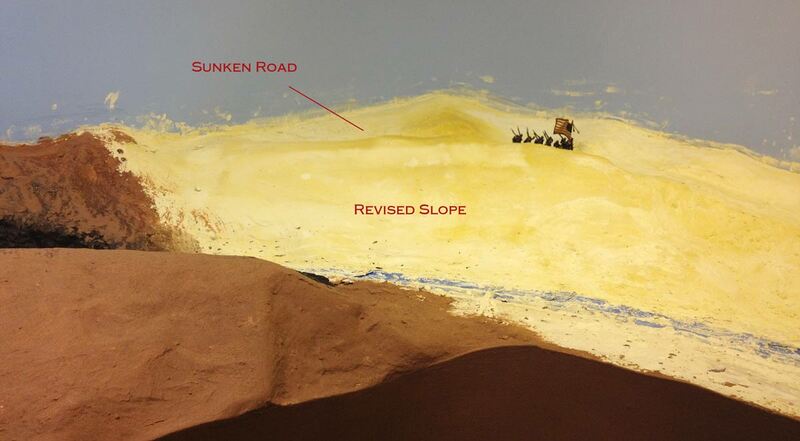 I continued the base scenery around the curve at Brooke as the panorama photo shows below. I will probably add the base scenery to the ridge behind Brook and then paint the back drop. In surveying the new work, AW's said, "Wow, do you think you'll actually finish this one?" A two shot panorama showing the big curve at Brooke. In a long awaited move, I finally painted the base scenery and fascia from Brooke to Accokeek. Only a 6-foot section to go and all the fascia and scenery will be painted the base color. I am using Ralph Lauren Adirondack Bark. It is a textured paint and does a great job making the fascia and the layout visually blend together. The base coat of paint makes a big difference. The layout takes on a much more finished appearance even though there is still lots to do. I painted the tunnel rock cuts leading up to the tunnel portal. Then I added a base layer of scenic material. That helped reduce some of the darker shadows so that it doesn't look so much like the entrance to Shelob's Lair. Rock carving at Weilepp's Cut is done, whew! The Weilepp's Cut area still needs to be painted. I also need to finish the mill so I can place it in the scene and fill in the gaps with Water Putty and scenic material. I have to install a road in the far corner behind Weilepp's Cut. I have to build up the road with pieces of foam and water putty, as the terrain there is fairly rough. The 2012 issue of Model Railroad Planning has an article about my layout. It was written by Gerry Fitzgerald. You might recognize him from this blog as he is one of my regular gandy dancers even though he lives in Charlottesville, VA where he is a graduate student at UVa while serving as a visiting professor at GMU. Gerry wrote the article with my permission and cooperation. I took the photos and did the graphics. I found it a bit strange reading about my layout in the third person, but Gerry did a great job with the article. He provided his own insight, not exactly that of an outsider, but certainly an independent look at the project. Thanks Gerry. BTW We still have about 5,000 spikes to go. Thom Metz stopped by tonight to discuss his plans for an NTRAK module based on Alleghany, Va. We are lucky that Matt Schaefer designed an excellent module based on Alleghany for Dudley Ross several years back. Matt was one of the best NTRAK modular designers ever. People from across the globe sought his design advice. Alas both Matt and Dudley have passed away, but their memory lives on in an excellent module design. "Curiously, to look at them, the impression is that the old bore is really the new one, and vice-versa. This is because the new bore was drilled for single track, while the old one is wide enough for two." The single track in the old bore gives the feeling of spaciousness associated with a newer excavation." I photographed Dudley's layout for Kalmbach's Great Model Railroads 2005 and you can find the overall track plan there. Here are some other shots of Dudley's Alleghany including a simplified drawing of just the Alleghany section. The main scene at Alleghany includes a turntable, brick cabin and depot. I recently learned that the Alco Heritage Museum in Schenectady has moved to a new, larger location. The museum will feature many neat exhibits including tanks, locomotives, a replica of an engine erecting shop, an FA-1 cab simulator, and a civil war railroad model display. According to the museum website, it plans to open in Spring 2012. Tanks, trains and models! I definitely need to add it to my bucket list. There are several interesting things I noticed in the photo. The obvious gallows turntable in the left foreground. The engine has an enclosed tender and it has the passenger car on its nose. The passenger car has a plain, arched, non-clerestory, roof, and small windows. Note the exterior bracing under the passenger car body. I am not sure why the wood is piled up by the track, possibly fuel? Also note the lack of trees in the background. There also appears to be a cemetery or perhaps encampment in the background. 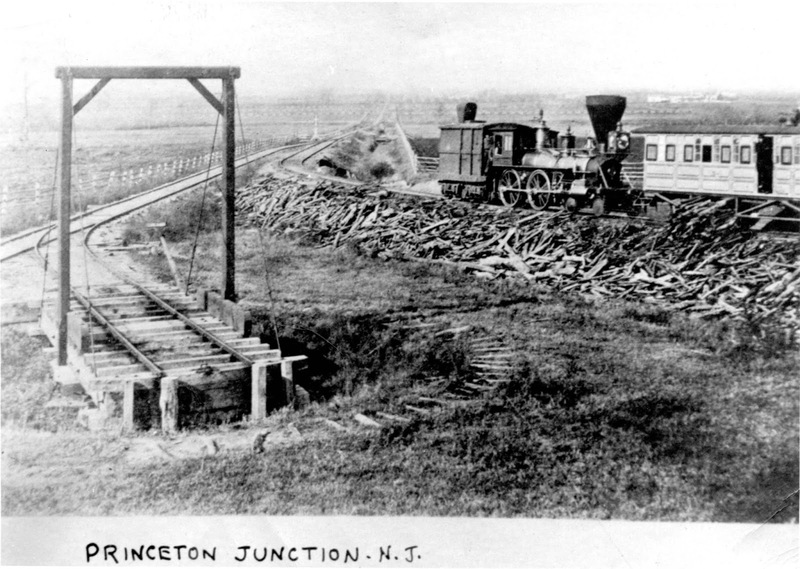 There is currently a legal fight between historical preservationists and the University of Princeton who want to relocate the station and convert it to a bus line. If you know anything about this photo, please post a comment. Top down, visor on, iPod synched - ready to boogie. There is nothing like a trip to sunny Florida in January. Prototype Rails 2012 is over and I had a good time. Here are some of the highlights. The FECNTrak group was present with part of their oNeTRAK layout. Gregg Stoll, Tom Chaffee and Matt Gatof gave me a run down on their layout and let me operate a train. Their oNeTRAK modules really capture the intent for oNeTRAK when I first proposed the oNeTRAK concept at the NVNTrak Christmas party nearly 15 years ago. They have some nice modules that combine intense switch districts and open running. They use balloon tracks at each end of the layout to reverse the trains. They are lucky that their prototype has an actual balloon track in Hialeah, FL that they selectively compressed for one of the loops. They use the other loop as a staging track. It was appropriate that I got held up at a grade crossing in Melbourne by a 150-car long northbound train on real FEC as I returned to my brother's house on the night I met with the FEC guys. I went to several good clinics. I especially enjoyed Dave Ramos's NY harbor layout presentation, John Roberts talk on his O Scale C&O layout, both of John Wilkes talks, Jim Lincoln's discussion of prototypical auto rack unloading and Gilbert's Thomas talk on the Tropicana Juice Trains. I had trouble getting my iPad to project the photos for my talk on my layout update, but everyone seemed to enjoy the talk nonetheless. My make-and-take class was small but the students all did great jobs. The meet organizers asked if I could return next year to do it again. On Sunday I visited John Wilkes and Tom Wilson's layouts on the west side of Florida before flying out of Orlando. They are both super nice guys and it was pleasure seeing their layouts. Both have impressive double deck layouts. I believe that mountain railroads are well suited to double deck layouts as the frequent tunnels and hills allow one to hide much of the infrastructure necessary in a double deck layout. John used aluminum C Channels for his benchwork and thus his layout seems to be built to Hadron collider level standards. His track work is very nice with over 100 hand laid turnouts. His scenery is also coming along nicely. It is a complex layout, with two helices and two railroads running parallel to each other with some shared track. But he has generous aisles and it all feels just right. I got to run a test train and I look forward to returning for a real op session. A scene on John Wilkes layout. He models the L&N and Southern where they share trackage. He uses Florida native lichen to make his realistic trees. Tom's layout is chock full of interesting structures. 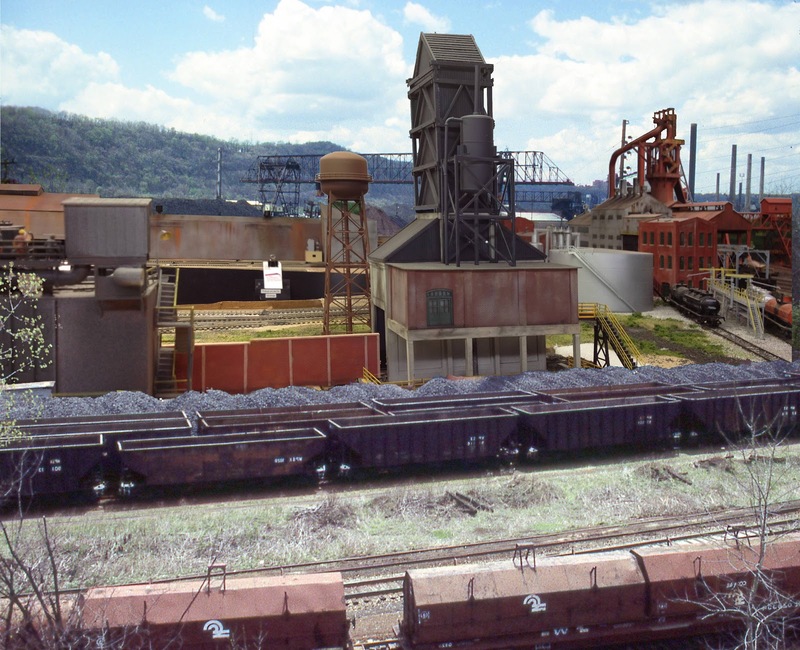 His upper deck is primarily devoted to a steel mill which was featured in my steel mill modeling book. I had a chance to operate it a few years back and it is a hoot. The lower deck is more rural WV and PA scenery. Tom gives me good ideas for future steel mill related projects and we may have some new items coming out soon. The Brass Monkey Bar - where workers go to flush the monkey? A little photoshop fun with some of Tom's cool mill structures. ﻿ I'm off to Prototype Rails 2012 in Cocoa Beach. I will be doing an update on my layout at 9:00AM on Friday, 6 Jan. If you are coming to the make-and-take, bring your tool box and a pencil soldering iron. I'll provide the kits and solder. The fee is $25.00. 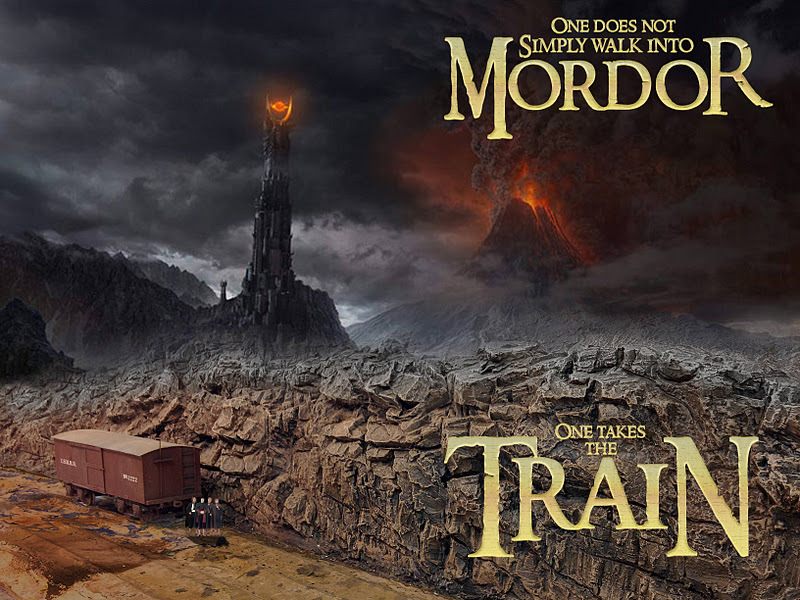 This is for those of you that thought that the rock face looked like Mordor. I always thought Middle Earth would make a neat setting for a Lord of the Rings inspired model railway. They didn't have steam power in Tolkien's world, so you'd have to come up with some other form of motive power. Water powered cable railway maybe? Unlike Sisyphus, I am nearly done with my rock work. I ran out of Durham's water putty or I might have finished tonight. Another night or two of of mudding and the basic terrain will be done. That will be a relief. Once the rock face at Brooke was dry, I painted it with a base coat of acrylic paints. I do the dark colors first as I like the extra contrast it gives me. So I use a mix of Black, Burnt Umber and Spice Brown to paint in the whole rock face, making sure I get the crevices completely covered. It can be tricky to get the cracks fully colored with the dark paint. Once that dries, I will add the highlights and mid tones using a mix or spice brown and a touch of white. You have to be careful when lightening red based colors to avoid a pink look. This reminds me of a story. I was carving rocks for a friend on his layout. He is very particular. I was using prototype photos to copy an exact scene. It was progressing well. When I got to the shadow painting phase he freaked out because he thought I ruined them. Anyway, it worked out as acrylics dry quickly and I finished the painting. A couple more cans of Durham's water putty and the rock carving will be done. I think the layout room will undergo a transformation when I get all the base scenery and fascia painted the base color. Rock faces on the tunnel portal. An N scale locomotive? What the ding-dong is that doing there? Checking clearances? Nah, I'm just fooling around. under the turnout. It is now hot glued to a layer of pink foam, braced underneath and is much sturdier. paint the medium and highlight colors. Why the reference to Sisyphus other than the obvious rock work connection? I have been known to start layout projects and get about halfway through, then rip them out or sell them and start all over. But this layout has been different. I hope I will actually complete it. It has taken me several years to realize what I like and can achieve in a model railroad. This layout seems to meet my interests the best. It is also pushing me to learn new skills in scratch building, and engine tuning. I have reached a model railroad Nirvana of sorts, though there still are many challenges ahead, such as scratch building engines, battery power control, model ships and the big waterfront scene - saving the best for last. Some of my friends are still struggling with this issue as they tear out and modify layouts, or can't even get started. Marty is documenting his machinations on trying what to model on his blog. Check it out when you get a chance. Gerry Fitzgerald stopped by for a work session on the afternoon of New Years Eve. He worked on fixing some loose scenery by Potomac Creek siding as well as spiking some more rail. I worked on adding hard shell and rock carvings. We decided that the rock carving process was interesting and worth making into a video tutorial. You can see the 12 minute movie below.